Note: The All Alaska Sweepstakes was the most important dog race in the Territory. 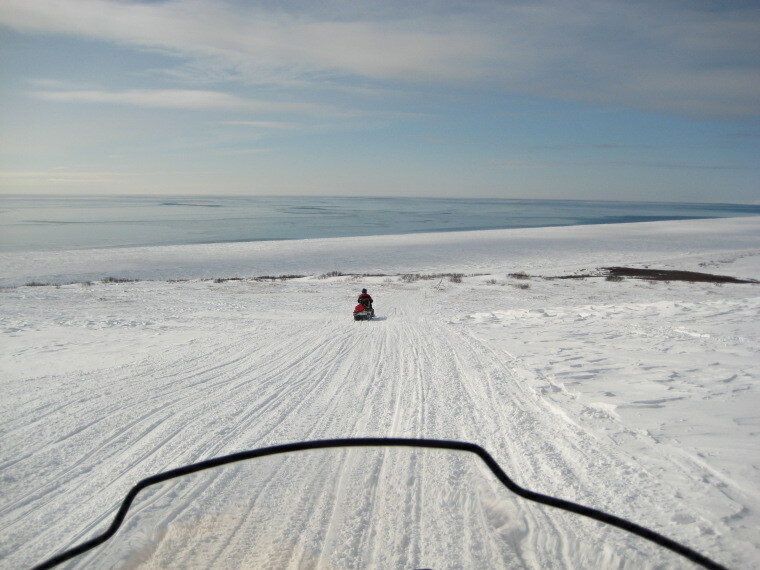 The trail follows 204 miles along the telephone line connecting Nome and Candle, and returns to Nome along the same grueling route. Telephone operators at the various checkpoints would hand crank the ringers and call in the team information to Nome, Candle and whomever was listening in. The race ran from 1908 through 1917, when World War One put an end to the race ... and the phone line. The race, using ham radios was run next in 1983, as the 75th anniversay race, and, of course, this 100th anniversary in 2008. I participated in both anniversaries, both times in Boston Creek. In 1983 I was the radio operator, and assited Dave Harding, the checker. In 2008 I was the Checker and was assisted by Ken Shapiro as alternate checker and radio operator. You have to understand that the AA Trail does not go over or across the Fox River. 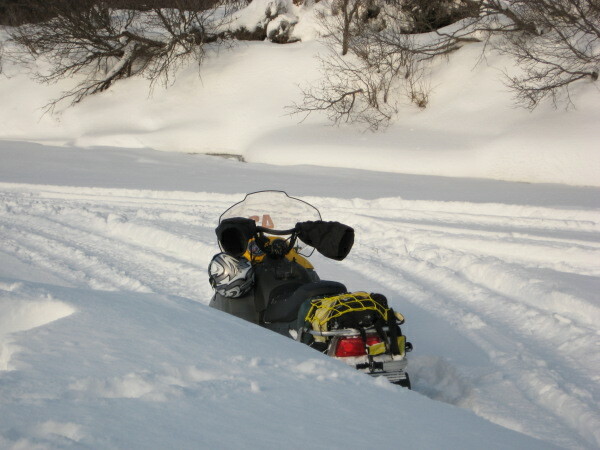 But we went that way, got stuck, shoveled, snowshoed and had all sorts of fun. This part of the Fox River has dark and deep woods. 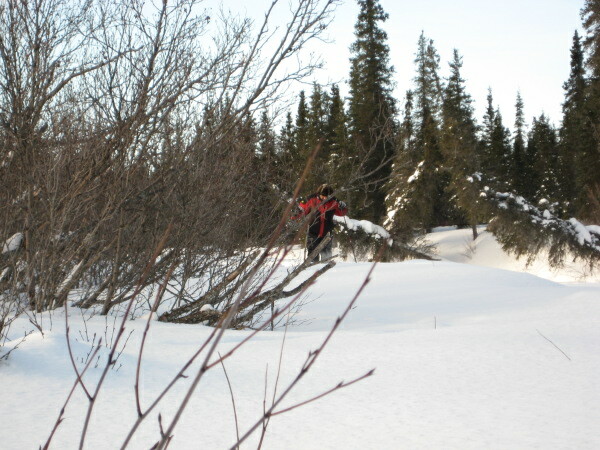 The snow was waist high and snowshoes were needed to stomp out a path thru the deep snow, along a crooked path. I did some of it, and got my machine unstuck and down to the river see previous photo. 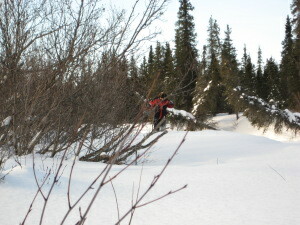 Then it was Kenny's turn to get some exercise on snowshoes. These were RedFeather 36's, with poles. The poles were absolutely essential! In 1896, Council was a gold rush town. 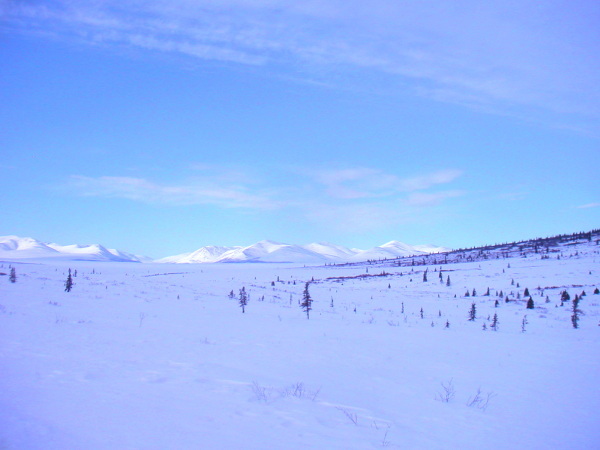 When gold was discovered near Nome in 1898, the bulk of the population followed the gold. Over the years the town has waxed and waned. This is a picture of the one-room schoolhouse, boys and girls outhouses in back, etc., in use until 1978. I noticed some jerk already stole the school bell. We parked our machines under the stern shadow of the school and imagined the happy ghosts of children and teachers playing, laughing and learning. At the end of Melsing Creek we climbed about 1,500 ft to the top of a hill (part of King Mountain). 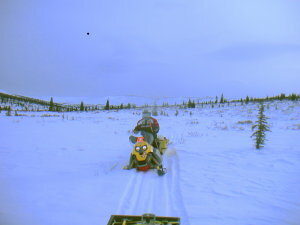 Here I am on my Tundra, #42, and behind me downhill is the Melsing Creek valley. The McCarthy's Marsh extends from the hills just east of Council westward to the Windy Creek pass into Death Valley. 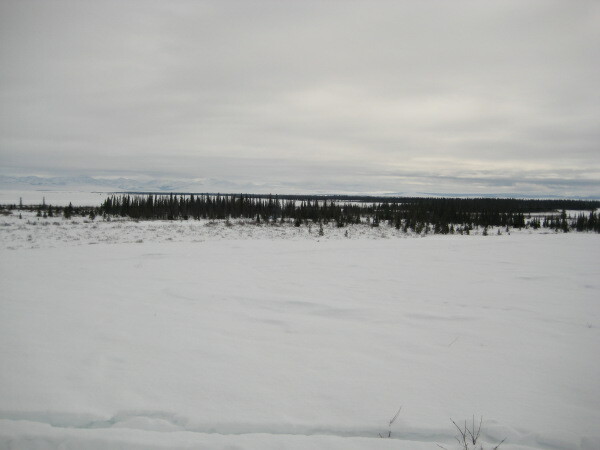 It is a forbidding place: Desolate plains, numerous lakes and ponds, and in the summer there are vast clouds of mosquitoes. 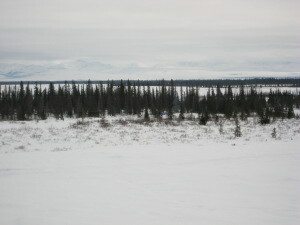 In contrast, several creek or rivers cross the Marsh, and provide for wildlife, shelter, and a break in the monotony of the area. There are several of those, Bullion Creek, Pargon River (most people erroneously spell it Paragon but that is not correct). Boston Creek is next eastwards, then Telephone. In the early years of the 20th century, a single strand telegraph line was strung across this forbidding plain, to connect Candle and Nome. After a few years, when the gold rush had calmed down, there was a dearth of Telegraph operators and the line was converted to telephone. We can let our imagination run wild, as there are no living witnesses of the thin wireline, but we can imagine a dog team, driven by a tough musher, following the poles and tripods of this line to a small log cabin in Boston. Here he would unhitch his team, bed them for the night, and light a fire in the cabin's barrel stove. On the wall sat a Stromberg crank telephone. 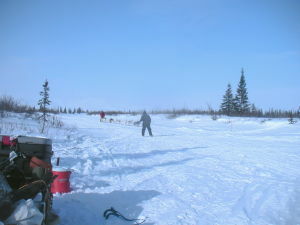 Our musher would pick up the receiver and crank ... one long, two shorts ... and alert Council that he was safe in Boston. To do this he carried a few batteries; the fate of year old batteries being uncertain. He then would take out of his bag some sourdough mix, a canteen, and some pemmican and make himself some supper and coffee. Back outside, he would unbag some dry fish and feed his dogs. His day's work done, he would look up at the sky, see the Northern Lights, and the swath of the Milky Way, and the wire dissapearing into the gloom ... to be eventually replaced by radios, satellites, GPS and other disturbances of the far off future. The McCarthy's Marsh seems endless. Those are the mountains connecting Mt. Bendeleben to the Darby's. In the far distance the low hills guarding the pass to Death Valley can be seen. 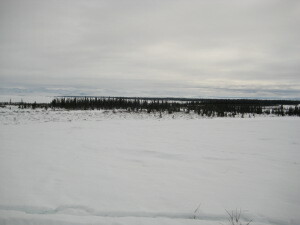 A short distance ahead is Bullion Creek. The Pargon, Boston and Telephone Rivers cannot be seen due to the rolling terrain. Somewhere in the distance is also Lava Creek. Where it enters the Bendeleben Mountains, there is a hot springs. Although we were close, we were unable to go there and soak. Next time ...! We come over a low hill, there before us is Boston Creek. We marked a trail from the Pargon to Boston; the eastern half into Boston remained in place for the race. 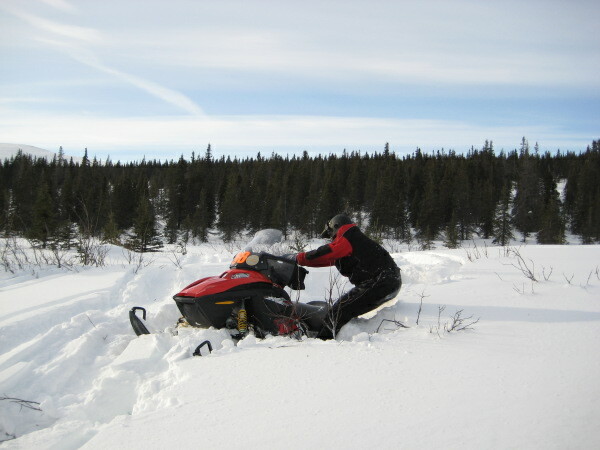 The trailbreakers realigned the western end near Pargon and back to King Mountain along a better and shorter path. Further downriver in Boston are a series of camps and cabins, including the one of Lois Ione and her late husband's, Marshal McManus. Neither the telephone line nor the Sweepstakes trail come within several miles of these cabins. This part of the upper reaches of the Boston is very secluded and lonely. 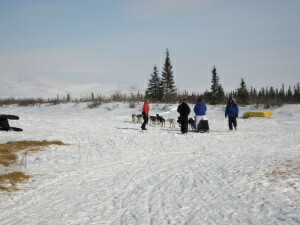 We got to the checkpoint area early evening of Monday, March 24th. 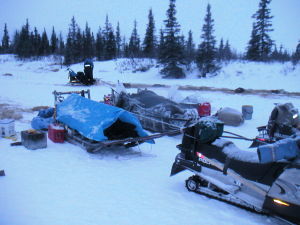 I helped Kenny set up the camp as best I could, but in truth I was getting very sick and was not much help. 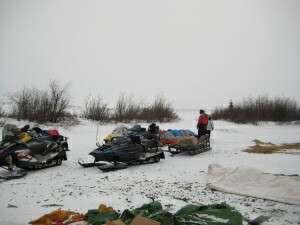 Lucky for us that we had left a lot of stuff prepositioned there, including our tent and various provisions. The tent was not in a good location; we feared that a wind could come up and blow it away, so we picked up the tent floor (plywood with canvas over it) and moved it to a sheltered location between some tall trees. Besides the shelter, the tall trees also made for a great ham radio antenna support. A thin poly line was tied to a wrench and thrown over a lofty branch. The wrench was jiggled to ground level while feeding out the cord. An all wire antenna known as a J-POLE was pulled up, and a length of RG-8X coax was attached and led into the tent. Without this antenna, Boston would not have been able to communicate, yet this antenna provided a full quieting signal to the SPARC repeater at Skookum pass, about 50 miles away! The Radio was connected to a size 24 AGM battery (automobile size) and worked flawlessly throught the event. 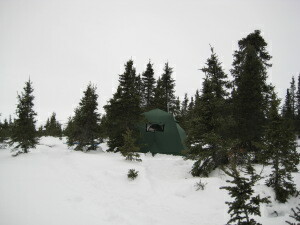 This is the camp as we first set it up and before we moved it 50 yards into the tall trees. Besides the lack of shelter, we also discovered that if a person was perfectly quiet you could hear water gurgling under the snow on that exact spot. Scary! And another reason to move! Some of the Mushers had quarters in Boston as well. 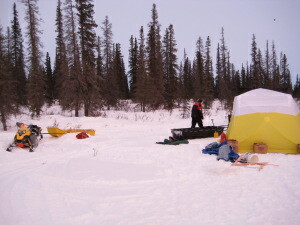 While we were there the first night, RT Lindner and his wife arrived with this 10 x 10 ft Arctic Oven tent. 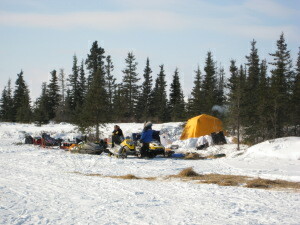 They set up a very comfortable and capable camp. RT is the son of Sonny Lindner, who came in 4th place. 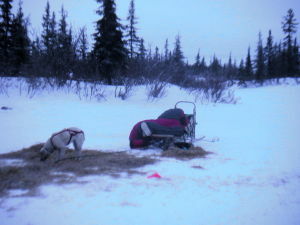 This particular musher seemed to us as one that takes extreme loving care of his dogs, and his son, RT and Wife are also exceptionally nice and capable people. They exhibited the highest degree of sportmanship during the race. It was a sad moment for us when they did not take first place. Jeff Darling and his team arrives in Boston. His handler and support crewman, Wink Gray, had been in Boston a few hours and had the dogfood warmed up and ready to go. That's Wink waiting. Here you can see not only Jeff Darling, but also the Checkpoint itself. 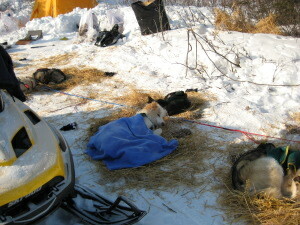 It was so cold, we put a blue tarp over the tent and it made a difference. This dog worked hard for Sonny Lindner, and he got that bit of extra attention. Here he looks like a perfect angel, eyes closed under his blue blanket, and paws pulled up sound asleep. Watch him for a few minutes and his paws will twitch and his eyes will roll under his eyelids. What dog dreams is he having? 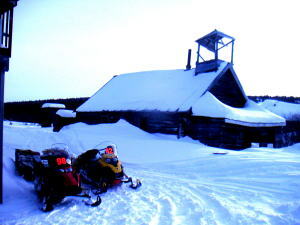 After a rest of several hours, Sonny Lindner departs for Council and hence to Nome. He rested himself and dogs in Council, and perhaps he was kinder to his dogs than other mushers were ... who knows? 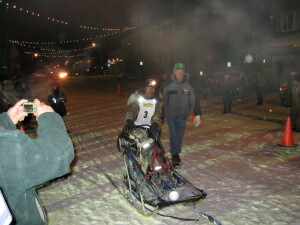 In any event, he was not able to catch up with the three leaders, Mitch Seavey, Jeff King and Lance Mackey. But in our hearts, he was the winner. Here is the business end of our Pelsue tent. This is a 30-second setup single wall poput tent. It is a 10 ft x 10 ft model, and has about 7 ft of standing headroom inside. 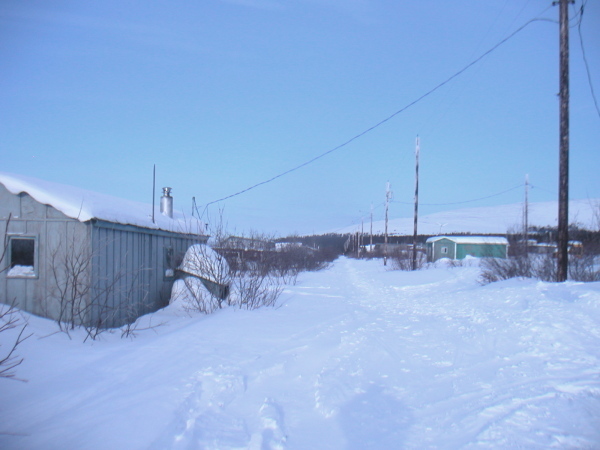 It is very spacious, but when the temperatures plunged to -30 and lower it was a bit cool. 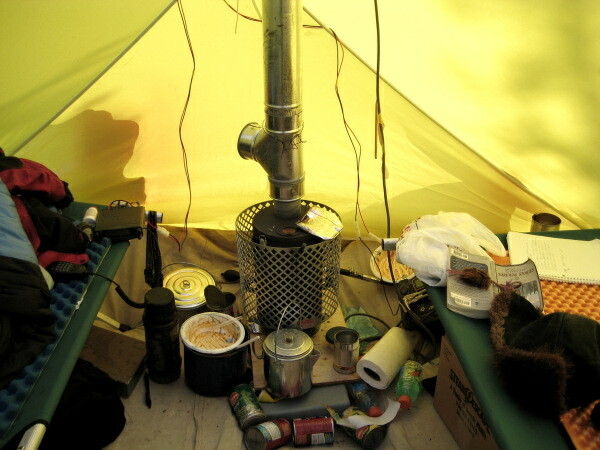 At the head of Kenny's bunk is his Yaesu FT-8900R ham radio; the Canadian built Trekker oil heater, then my bunk with the novel "Survival Stories" open to the page I was reading. Various pots and pans, cans of food and the typical camping mess. Unlike the old days when we had such luxuries as Blazo Boxes to keep things organized, we had to put things on the floor because damp/wet cardboard boxes and Action Packers simply do not do the job! 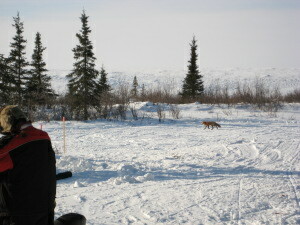 Not all visitors are people; here is one of our furry friends, a Red Fox. His mate is out there somewhere, and they bark and yelp to each other in a language we are not smart enough to understand. 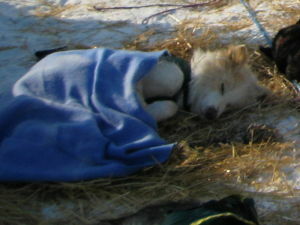 This fox, or his partner, have never seen people and were fearless but cautious. Kenny has a video of the fox coming within 20 feet of him, and I had hopes of having him eat out of my hand. But he was too cautious and foxy! We also had a moose come visiting, as well as several Ravens with their eerie "whoosh whoosh" as they fly by in the otherwise dead quiet. There were several other feathered friends, including tweey birds, snow birds and several woodpeckers. We enjoyed all of them, and I hope they did not mind too much the noise and excitement we brought briefly into their lives. Here is Conner, only one foot visible, at -30F weather. 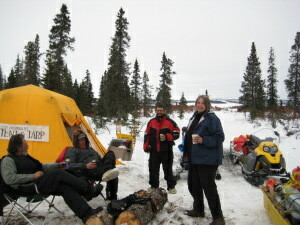 This is early in the morning, before they woke up to break camp and move on to Council and Nome. These are very tough people under very trying circumstances. Our hats off to them for making it. They have what it takes! 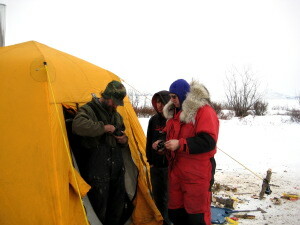 Checker for Telephone, Roger Thompson exits his AO-10 tent at Telephone; Jim Stimpfle in his Santa Claus outfit chats with him, and Roger's son, Amos, peeks from in between. 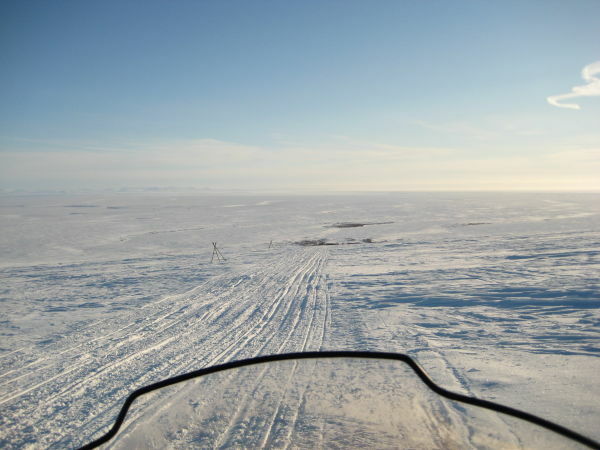 I took a snowmachine trip from Boston to Telephone partly to see the place, and also to replace the low power walkie talkie that Roger was using with poor results, and replace it with a high power Alinco DR-605 and a fresh antenna. Immediately this radio went into service, the signals were full strenght direct to the Skookum Pass SPARC repeater, and there were no further communications problems out of Telephone. Kenny had gone there as well a couple days earlier. He brought the half gallon or Ice Cream. We loved the place. While at Telephone, who else but the indomitable Jim Stipfle, Tom Sparks and Roy Ashenfelter arrived from Haven. These three were with BLM in some capacity, and had deployed the Windy Pass ham radio repeater. 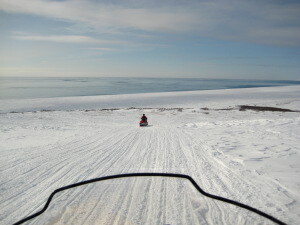 They preceded us on the way back to Nome. The tent was set up on the river itself, there was a water hole just out of sight to the left, and behind the tents and camera was a stand of spruce. Beautiful spot, and an excellent Checkpoint manned by one of the most experienced Nome outdoorsmen: Roger and Amos Thompson! Jay Wieler and his Piper PA-18-150 Supercub was a frequent visitor, most often with Race Marshal Al Crane (who is also a Supercub pilot). Jay was so kind as to bring us a gallon of vanilla icecream, which we shared with the Telephone checkpoint. 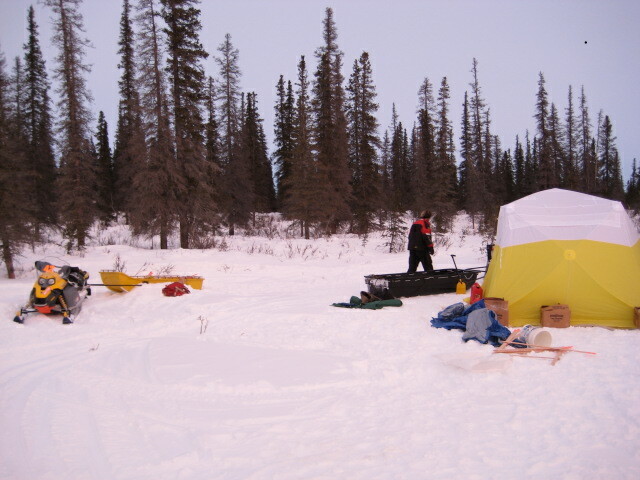 To accomodate airplanes, which we thought important, we marked out a safe area on the river, and then packed it with about 30 passes of the snowmachines. 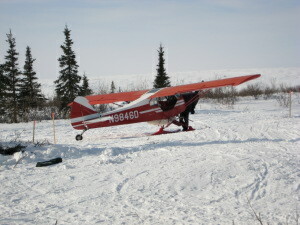 The result was a 3,000 ft long by 100 ft wide airstrip with clear approaches and good overuns. We were visited by several airplanes. I'd like to think that while this was not the most important landing area in the race, it was the best airfield. We called it Logan International Airport. We left Sunday, March 31. As I look back, I see a plume of smoke there where the trash fire was dying out. Who knows if I will ever see this place again? I loved it ... I wish I could stay there forever, but with regret I realize that there is another life to pursue. My association with Boston spans 25 years. This was for me a trip down memory lane. It has been 25 years of deep changes in my lifestyle. different interests, partners, wife, children and even spiritual life. Farewell, Boston, perhaps I will see you again! 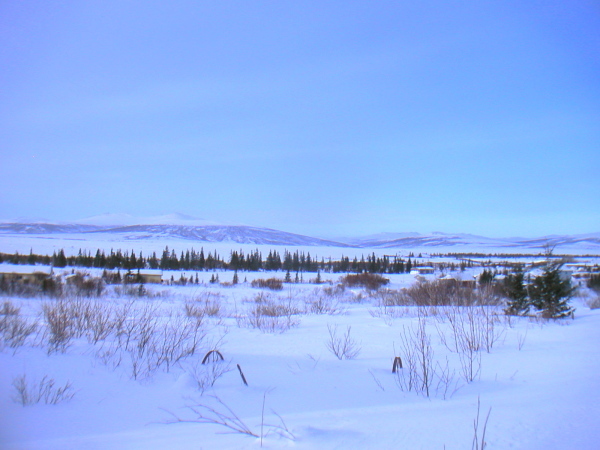 Here is an early morning view from Council, looking west across the Niukluk River. 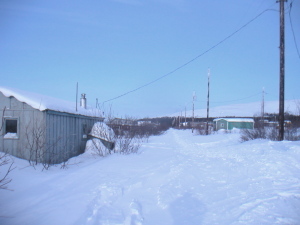 It is serene, and the population in the winter is normally zero. But once in a while someone will go out there and spend some time; or an event like this race will pop up, and then Council comes to life. This is a picture of Main Street in Council, looking north. Notice only footprints there, human and animal. Some old snowmachine track. This picture was taken in mid-March, when we were there earlier scouting around. By the time the race was going full blast, the population in Council swelled to over 100 persons, and this was a bustling avenue! 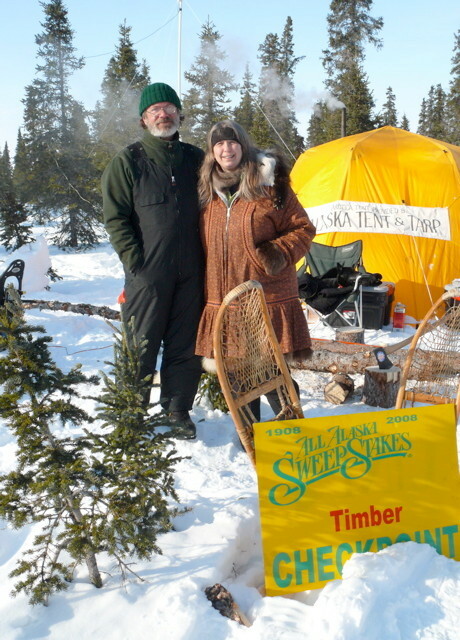 Susan Steinacher and Glen Pardy were the checkers at Timber. The upper picture is their living quarters, and what height of luxury! Neat as a pin, a small 12" woodstove, and everything in its place -- a woman's touch for sure in this AO-10 Arctic Oven tent! The lower picture is of the actual checkpoint just 20 yards away. The yellow Arctic Oven "Arctika" model is a 12 x 13 hexagon, but the floor area is not much more than the AO-10. Seated are Glen Pardy and Mitch Erickson, while Sue Steinacher and Ken Shapiro are standing. I guess I am going to have to get me one of those kinda tents! Just 20 yards away is the actual checkpoint, in the yellow Arctic Oven "Arctika" model. This is about a 12 x 12 tent, but is six-sided, and the floor area is basically the same as the 10 x 10 model. However, the corners make for handy places to stow gear. This tent is the official checkpoint, and being a separate tent keeps the business of running a checkpoint separate from the living quarters. Susan and Glen posed for the camera. Note the homemade Parka she wears. Besides being a checker and radio operator at Timber, she was also the Checkpoint Coordinator for the race. This means that she organized all the checkpoints and catered to all their needs. She was an essential part of the race, because without checkpoints and trailbreakers there would have been no trail and no race. And of course, she is a real sweetheart. Lucky Glen! Descending into Topkok you can see as a little green speck, the NKC shelter cabin. This is the start of the infamous blowhole, an area that generates high winds and whiteout conditions. 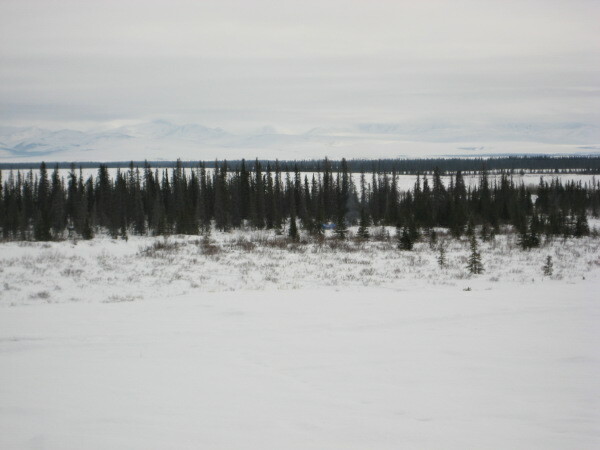 Many persons have lost their lives in this area, and the Nome Kennel Club is to be commended on erecting a sturdy cabin there. This is the sturdy cabin the NKC built at Topkok. The Fire Department and the SPARC ham radio club maintain it. Note the solar panel, strobe light and ham radio antenna. Inside is a 55-gallon barrel wood stove. This cabin has saved many a life. 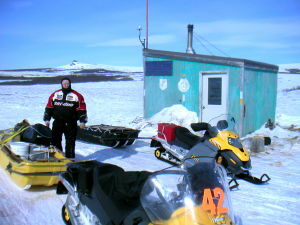 Fred "MO" Napoka came to Nome to race in this event. 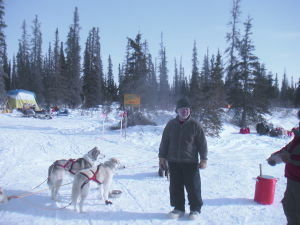 He is a dog mushing instructor --the only one in Alaska-- for the LYSD. His handlers were the high school boys and a chaperone. Right at the start his lead dog had an injury, and Fred carried the dog in the basket for the entire course of the race. This mishap placed him outside any possibility of getting a big prize. However, his ready smile, good treatment of the dogs, and an enthusiastic support crew --and unstinting sportmanship-- made Fred a favorite with Nomeites. Congratulations, Fred, on a job well done! 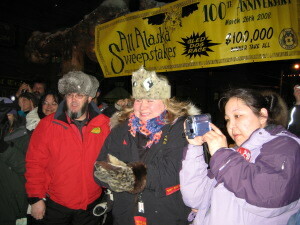 The reigning All Alaska Sweepstakes Queen, Janice Doherty, greets Fred Napoka, who arrived at 11:59 PM. Note her crown made of Sealskin by Dora Ahwinona, a talented skin and bead artist. Slightly behind her is Dr Phil Schobert, the Director of the All Alaska Sweepstakes race. In an alternate life, Janice works at Wells Fargo, and her smile and good cheer always bubbles forth. And in case the dog is fussy, or needs special attention, bet it physical or just moral support, the handler went as far as hand feeding and tending to the dogs. Normal for these folk. It was great. 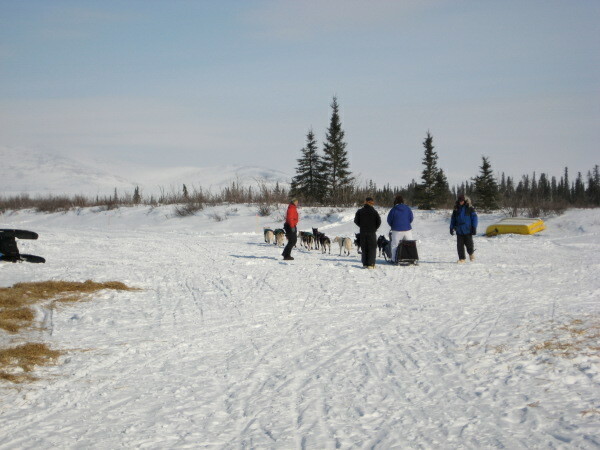 The race was run by a total of 16 dog mushers and teams. 14 finished, 2 scratched. Two local Nome Women competed, and finished: Cari Miller and Kirsten Bey. These are the first women ever to complete the Sweepstakes in its 100 year history. Being a volunteer was an absolute blast. Incredible fun, and I would do it all over again in a heartbeat. I feel particularly honored that we saw what I think is not only the best face of Nome, but also the best side of people. It was great to see man and dog work together, and to see the support crews help out with the dogs. A few lessons were learned ... the uninsulated tent was cool at -20F and colder weather with the oil stove. An oil stove does not put out the heat that a woodstove can. Also, the logistics of transporting stove oil over 130 miles are --to put it kindly-- a pain in the arse. However, the oil stove was a champ, behaved well, and would be eminently suitable for places where the lifeline is shorter. 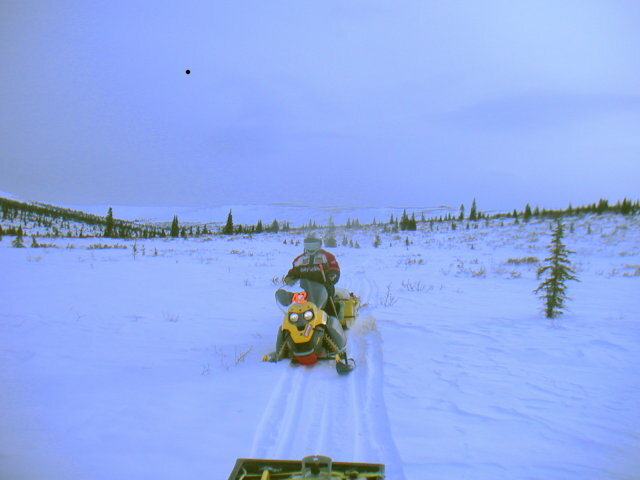 Just don't spill oil jugs in the sled! Organizing the stuff with some sort of cabinet or shelf unit is a must. We literally had everything needed, but a lot of stuff could not be easily got at because we had to search for it. A lot of items ended up on the floor, or in the wrong bag. Having everything in its place, inventoried and neat is my goal for the "next time." Radio communications for us in Boston were excellent. Likewise in Telephone after I got done setting up a high power radio there. Using a walkie-talkie, like some checkpoints did, does not really work. Kenny and I put up this high power radio, a good battery, had a generator, and the antenna was lofty and way up a tree. It was a good setup and worked very well indeed. We made many good friends, and our favorites were Sonny Lindner, Jim Lanier, Kirsten Bey, Cari Miller, Jeff Darling, Conner Thomas, Fred Napoka and the winner, Mitch Seavey. 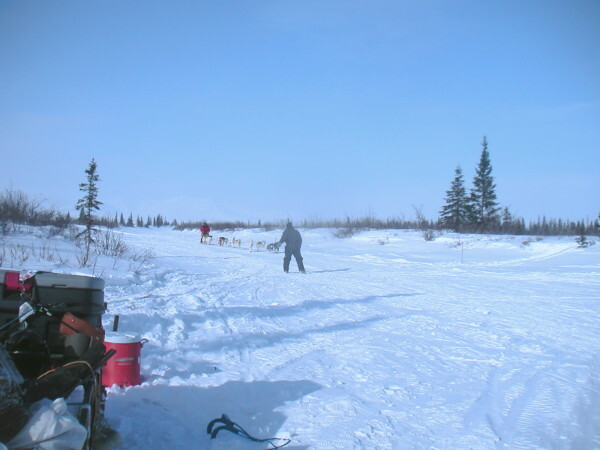 They were not only good mushers and treated their dogs well, but also extended the hand of friendship to us at the Boston Checkpoint. Thanks guys! See you in 2033! Copyright © 2008 Ramon Gandia. All rights reserved. Photos: All photos Copyright © 2008, Ramon Gandia, except as noted. Please contact the author for permission to copy text and/or pictures.